"Hello. My name is Otis, and I'm a 4 yr old "Olde English Bulldogge". I love my new coat. It's warm, and keeps me dry when it's raining. My old coat was used as a pattern, and as you can see by the look on my face, I'm very proud. My new coat was made out of materials left over from old sewing projects so it cost almost nothing. 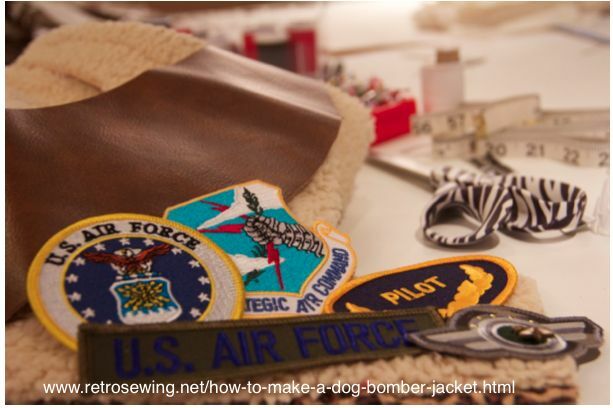 Read on to learn how to make a dog bomber jacket. How cool is that! 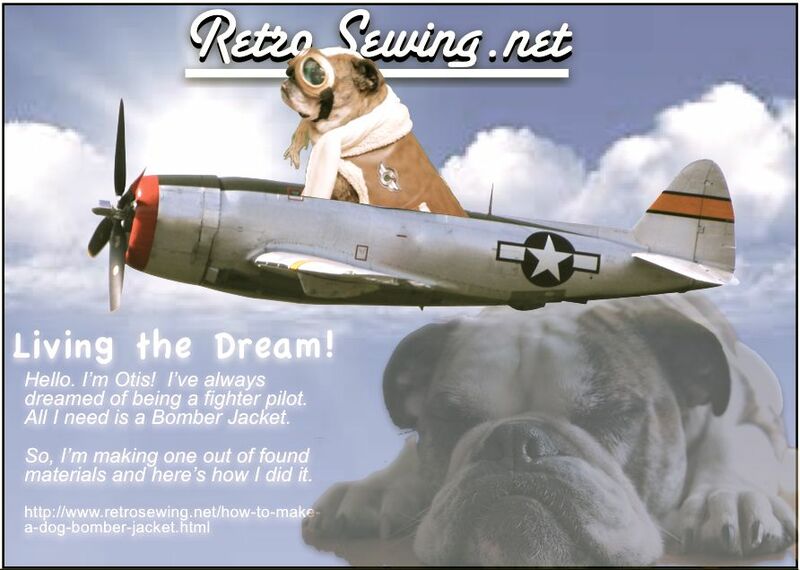 "This page is all about the making of the bomber jacket, and I'm not allowed to talk about myself too much here, but if you want to see more photos of me, my career, my favorite sports, and more, then check out the new webpage here on theDIYeffect.com (formerly RetroSewing) called Bulldog Photos all about me. They call me Otis the Wonder Dog"
"Here's my coat before patches and pockets, with a wrap around belt & Velcro belt closure". 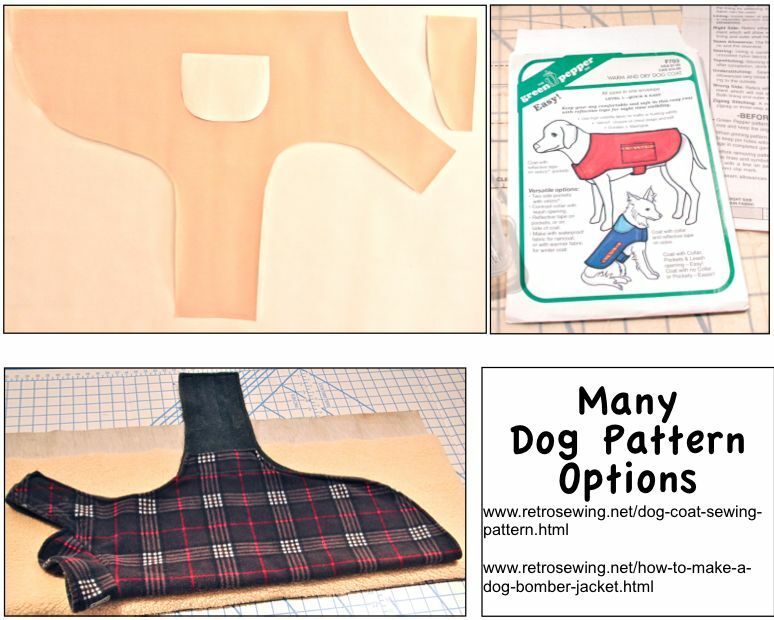 *Pattern-Make one out of old dog coat, use a commercial pattern, or design your own custom pattern. *1 yard appx (depending on dog size) Brown leather, imitation leather, naugahide fabric, or any washable brown fabric you like. 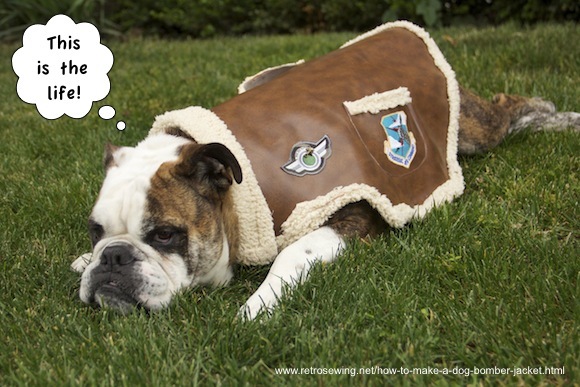 *1 yard appx (depending on dog size) Faux sheepskin or something simular. 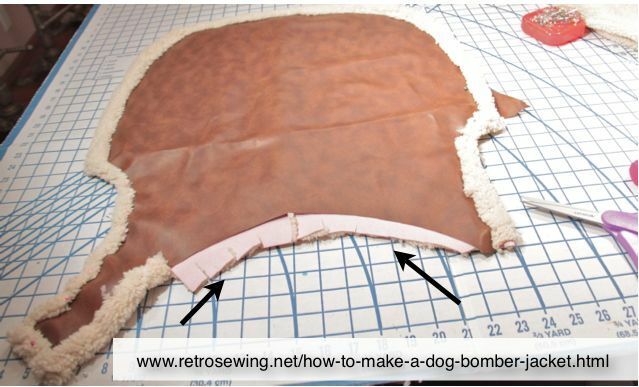 Use an old dog coat as a pattern or a commercial pattern. 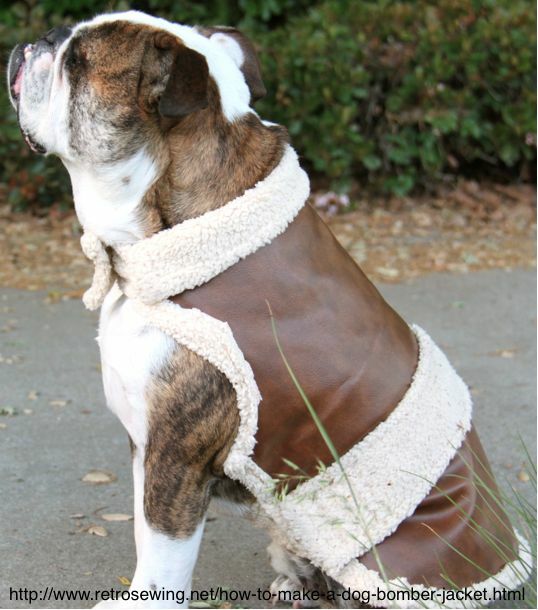 If using an old dog coat: lay the folded coat out on a large folded piece of paper or muslin, and trace. Butcher paper, newspaper, etc. Careful of ink that rubs off. If using store bought pattern you already have review the directions along with this tutorials. 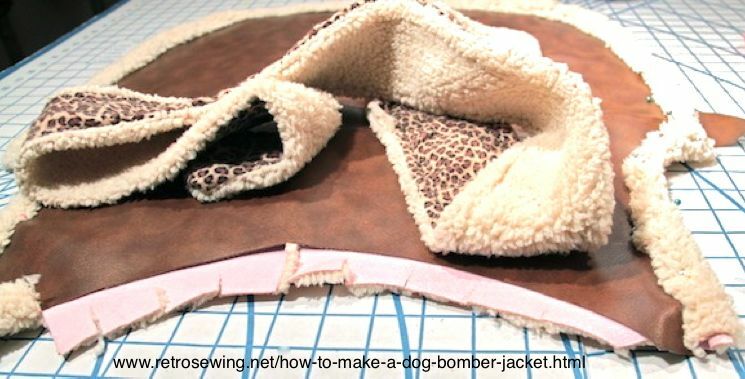 Note: Most dog coat patterns can be used to make this Bomber Jacket, but be sure to read the directions below first since the assembly of this coat is different then most. Once you are happy with the pattern, cut it out, try it on. Check neck and waist as pictured above. Mark the placement of the Velcro and/or any other closures. Options for closures would be buttons, snaps, clasps, large hook, buckles. Some of this would depend on what works best for you and your dog. If he's a rambunctious dog, you may want something real sturdy. 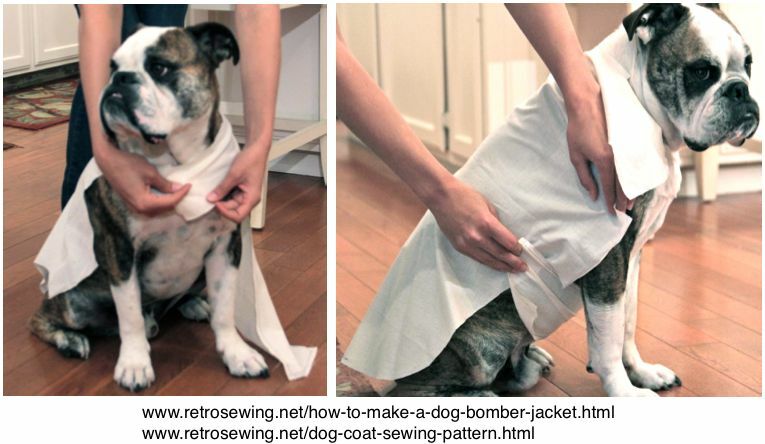 Be sure to try any new pattern on your dog before cutting fabrics. In this photo we made a cloth pattern out of muslin, but either paper or cloth will work. Fold the fabric in half and fold the coat in half. If you're using a paper pattern or cloth pattern be sure to place the pattern on the fabric where it says "Place on Fold". Lay the folded coat on the folded fabric as pictured here. This is how you get both sides of the coat exactly the same. Right side of both fabric facing out. 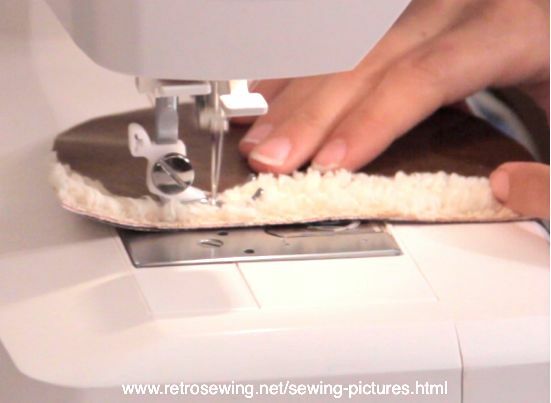 Although pockets are optional this would be the ideal place to sew them on, but before doing that, sew on trims and patches, or try rubber cement (follow directions on bottle). I've done both and it's worked well either way. Once pocket is complete, sew onto the coat where marked using a top stitch of your choice. 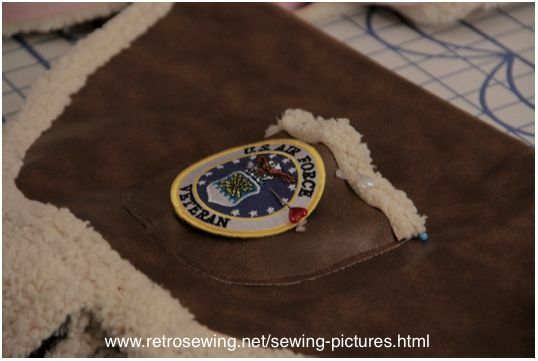 This patch is going to be sewn to the pocket using a basic top stitch. You could get fancy with the stitches since they will show, but we kept it basic here. 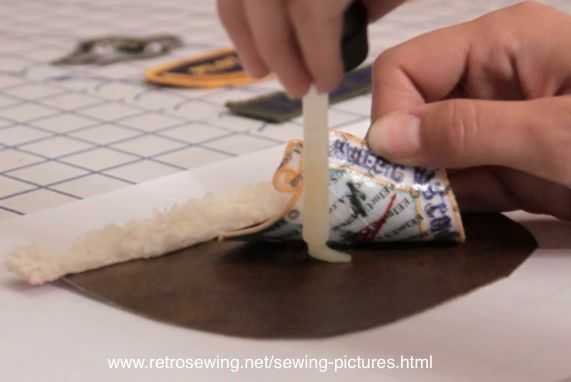 A dab of glue in the middle instead of pins was used to hold it in place while sewing. Above: Lay it out just the way you want it to look when done. Leather on top of lining with wrong sides together, right sides out just like they will look when finished. The amount folded over would depend on your personal taste. Remember the sheepskin/lining has been cut 2 to 3 inches larger then the outer leather fabric. 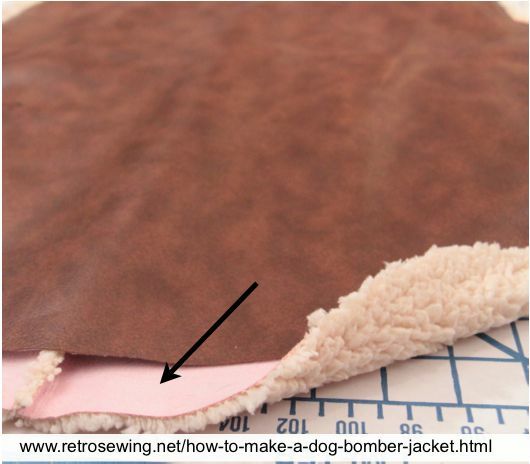 Fold the sheepskin lining over the brown leather all the way around (except collar), and for a more finished look hem the edge of the lining. Many large pins were used to hold this all together. Top stitch all the way around, leaving the collar area open for collar. Then sew all the way around including collar area. This gets thick so again make sure your sewing machine can handle coats. Should look like this after sewing together. In this case a collar was added. In keeping with recycling when ever possible, a ready made collar from a previous project was used in this example (photo above). 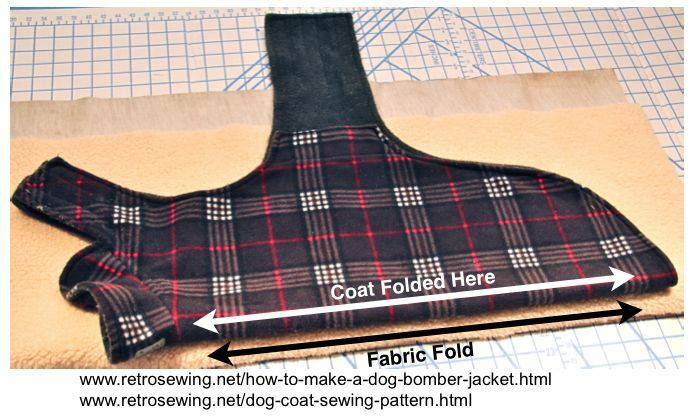 Originally made as a belt, but being re-purposed as a belt for this new dog coat.Other options are to use a collar from the pattern, or trace from an old coat. 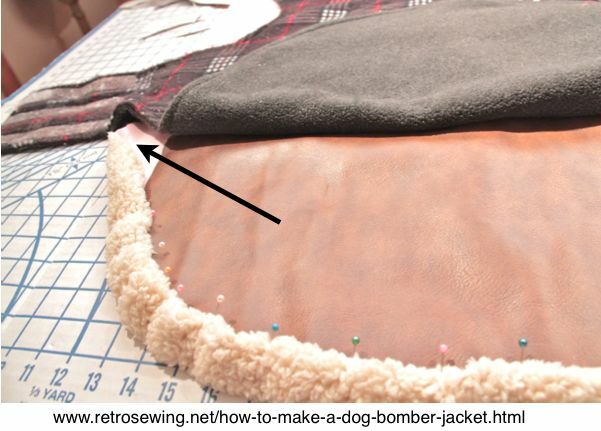 Place the collar (lining/sheepskin) in the neck opening (pictured below) between the two layers of the coat. The process should look like the photos below. Tuck collar between the two fabrics as pictured here, and pin together until you're satisfied. Top stitch all layers together. Again, make sure your sewing machine can handle the thickness. Mark the location the Velcro should go. 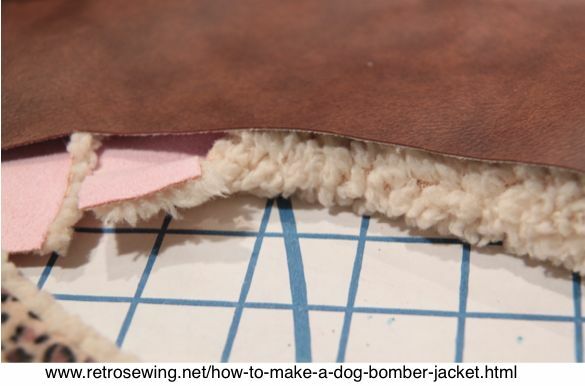 Ideally, mark it on the pattern and double check by trying the coat on before adding Velcro. Sew all the way around the Velcro. Two strips of Velcro on each side of collar. Try it on for size before and after attaching Velcro. Here's a close up of the collar. I used cement glue to add this patch. With Velcro, and two layers of heavy fabric to sew through it was a much easier option and is working well. Many ways to attach a belt. Here are two. Above Velcro, and below a button. Velcro is normally used here, but I decided to use a button to add a little more style. Velcro is most commonly used for the belt, but make sure it's sturdy. The pocket on the right was sewn on with a top stitch after the coat lining and leather were sewn together. It worked out fine since this fake sheepskin is very forgiving. 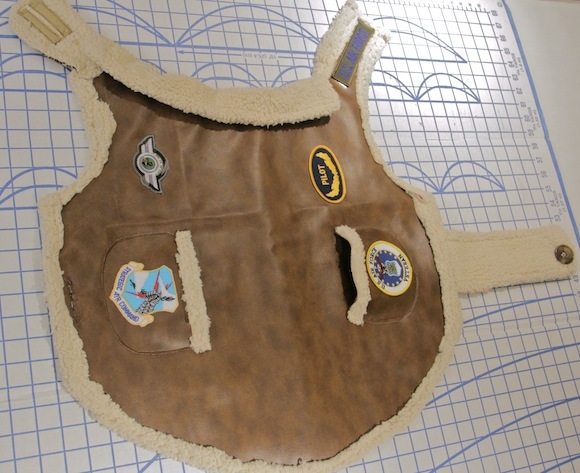 Cement glue was used to attach everything else except the blue patch on the left, and the sheepskin trim. Both applications worked well, but if your machine can't handle all that thickness, then definitely opt for the glue. Cement glue is used to glue leather shoe soles together so it should hold well. Sew trim all the way around. Use a fabric fraying preventative as directed on back of bottle. This takes time to dry so allow for that before sewing. Ideally the pocket should be done when attached, and it should be attached before the leather and sheepskin are sewn together. In this case it was decided after the coat was sewn together, so this pocket will be attached to the finished coat. If you choose the glue option, first mark the spot you want the patch and spread the glue inside the markings, then press patch and hold for a minute (follow directions on bottle of cement glue). 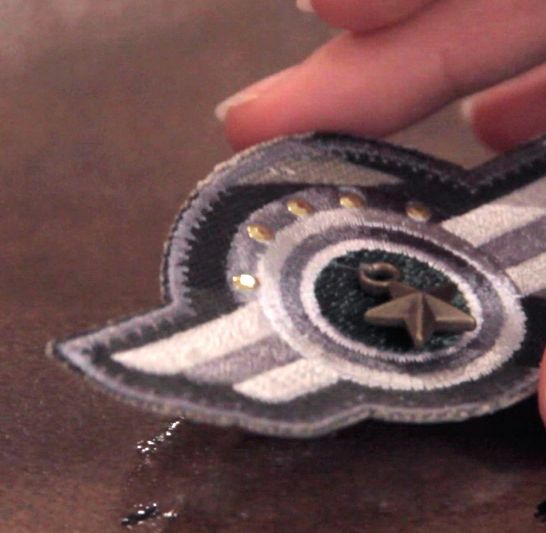 This patch and trim is pinned in place here, but will be glued on just like the patch in the above photo. 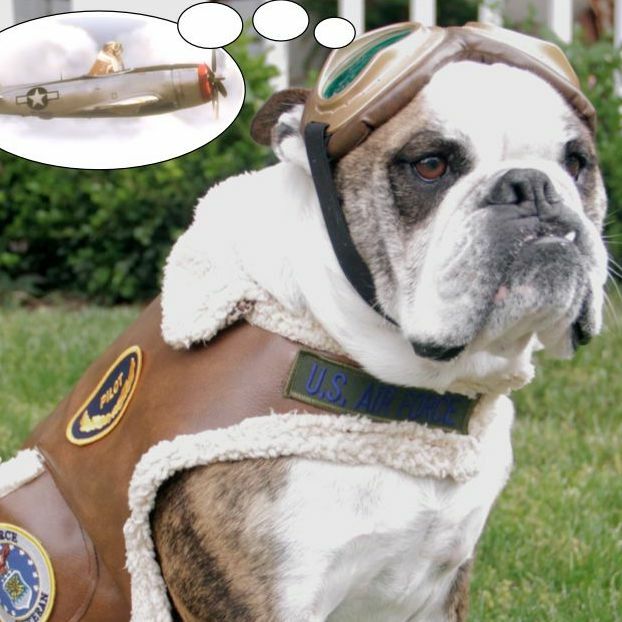 "Just relaxing and modeling my new Bomber Jacket. My pockets are great for treats. Even my leash fits in these pockets. My new coat is very soft and warm like my favorite blanket. Enough room in my jacket to spread out on the lawn, cross my legs and day dream". Make sure your machine is capable of handling coats. 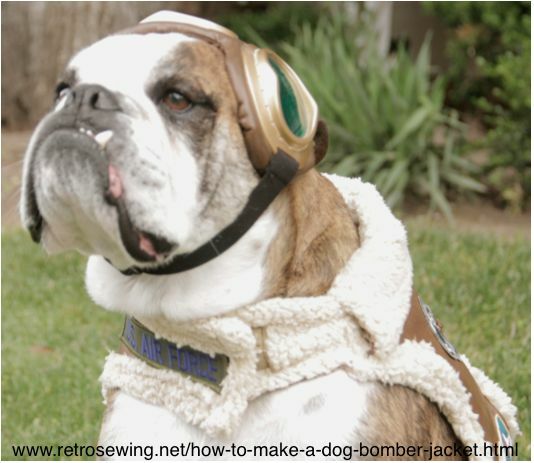 A Husqvarna sewing machine was used on this dog Bomber Jacket. A machine with metal vs plastic parts will most likely do the job nicely. Leather or naugahyde, and sheepskin are thick when put together. If you add pockets and patches it gets even thicker. 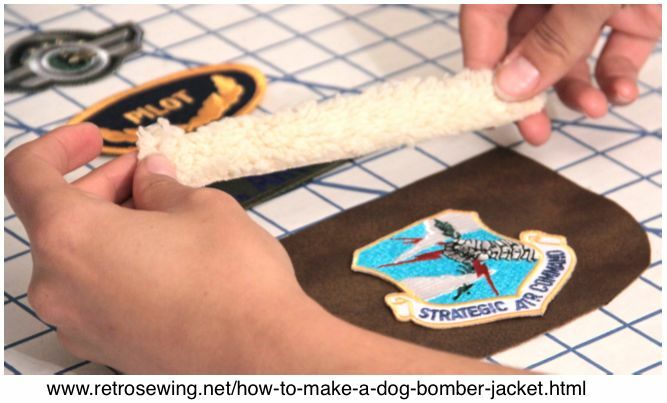 This Bomber Jacket dog coat is sewn very differently then most dog coats, so read thoroughly. 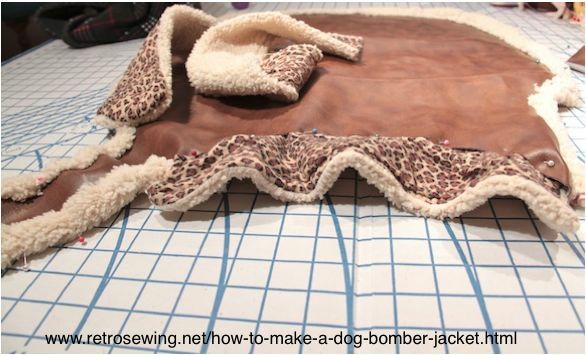 A lined dog coat would normally be sewn with right sides together, then pulled right side out, but this Bomber Jacket is sewn with wrong sides together (right sides out) and we added enough extra sheepskin to wrap all around the edge of the leather/naugahyde. Recycle, reuse or repurpose whenever possible. This coat was made of materials from past projects. 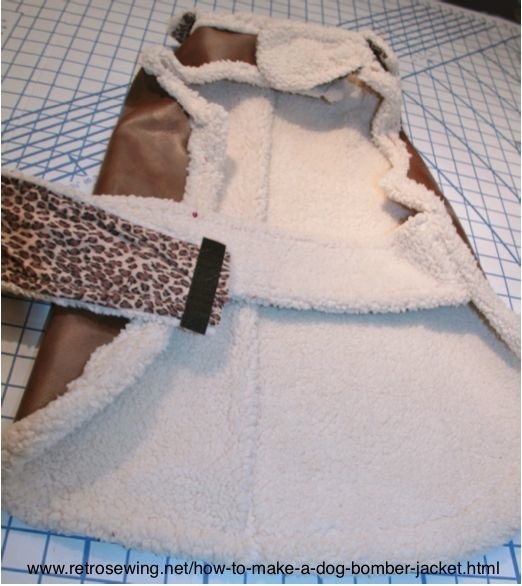 The collar and belt were originally made into a scarf which is made out of faux sheepskin and leopard print. After scouring your house, garage, and attic, there's always thrift stores, garage sales and flea markets. Wash all fabrics in advance to make sure the coat can take the washing after use, and any shrinking can be taken into account during the sewing process. This naugahyde and fake sheepskin washed up nicely in warm water on regular setting. You can follow it as it is, or change it up. So many options. One of the great things about sewing, is you get to be the designer. Change it to whatever suits you and your dog. Belt all the way around, or strap across the bottom. Velcro, button, snaps, buckle, etc. Pockets with a flap, button down flap, fur lined or no pockets? So many possibilities.